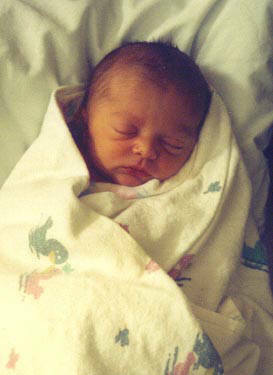 Jonathan Michael Phelps was born March 8, 2000 in Provo, Utah. He weighed 6 lbs. 5 oz. and was 17 inches long. He was born with 7 fractures. My pregnancy had progressed quite normally. This was our first baby and we had a feeling it was a boy, so at our 20-week ultra sound we were excited to find out that we were right. Everything was normal with the ultra sound, the Dr. did mention that his femur measured a little short although it was still within a normal range so he wasn't worried. We just laughed thinking the baby was already taking after his Dad who was quite tall, but had short legs. At 36 weeks we learned that the baby was breech. My OB was going to schedule me for a procedure called an external version, where doctors, with their hands on my abdomen, would manually try to turn the baby into a head-down position. My amniotic fluid level was checked to make sure that there was enough fluid to allow the baby to turn, however my fluid turned out to be very low. After monitoring the level of amniotic fluid for a few weeks it finally got too low and on March 8th they decided to do a C-section. The C-section went well and the doctor held up the most beautiful baby boy! My husband went with the baby while the doctor finished with the C-section. Right away the nurses realized that Jonathan had a very high-pitched painful cry. They called our pediatrician and asked him to come take a look at the baby, rather than waiting for his normal rounds in the nursery. After determining that there was some tenderness causing pain in Jonathans leg the doctor took an x-ray of that leg. They were very shocked when they found 4 fractures in a healing state in that femur. An x-ray of his entire body revealed another healing femur fracture in the other leg, a broken rib and newly broken arm. The doctor explained what he found and was honest in telling us he did not know what this was, but said he was going to call a number of specialists and consult with them. Eight hours after Jonathan's birth we first heard the words Osteogenesis Imperfecta, and within 24 hours the diagnosis was confirmed. Luckily our pediatrician put us in touch with Shriners Hospital in Salt Lake City just 45 minutes from our home. Shriners had doctors who specialized in OI and within a few days Jonathan was scheduled to go to an OI Clinic at Shriners when he was 4 weeks old. Our pediatrician also put us in touch with Annie Miller, a wonderful occupational therapist who happened to have a considerable amount of experience with OI and who also worked in the hospital we were at! She came to visit us the day after Jonathan was born and was a true lifesaver! She showed us how to hold Jonathan on a pillow and how to gently change his diapers. She was amazing and gave us the confidence we needed in caring for our baby. 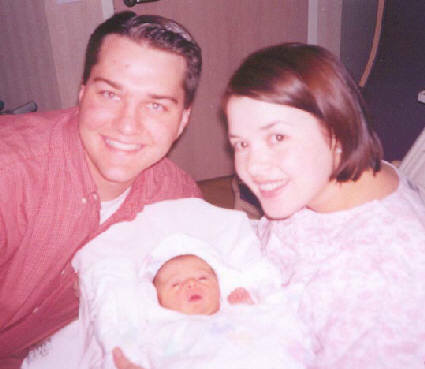 I remember Annie telling us that the doctors and nurses had no idea how careful they needed to be with Jonathan and that we either needed to keep him in our room at all times or to just take him home. Jonathan came home with us when I was discharged from the hospital after 3 days. Annie was assigned to be our Occupational Therapist through the local Early Intervention program and visited us once a month. We also had a Physical Therapist come twice a month, and again, we were fortunate enough to have a PT who had worked at Shriners before and had OI experience. We also came to know a wonderful family, who lived 5 miles away, where the father and his 2-year-old daughter had OI. This family was so very kind to us. The father came over many times during those first few months when we felt so helpless. If we felt that Jonathan may have fractured something he would leave work and come over right away, showing us how to gently feel Jonathan to try and locate where a fracture might be. While learning that Jonathan had Osteogenesis Imperfecta was quite a shock to us at his birth, we just loved him more than we ever imagined. He was our sweet little baby and we were his parents! We knew that there was no trial that he would face that the Lord and a loving family couldn't help him get through. We were blessed to be in touch with so many wonderful people who helped us. Though those first few months were such an adjustment, a time of learning and patience. We had our fair share of tears, but more than our fare share of smiles too! If you would like to talk to other parents of OI children, please join our email list--OI Parents. "OI Parents" is a place where parents of infants and children with Osteogenesis Imperfecta (OI) can share information, learn how to care for a child with OI, and connect with other parents going through similar experiences. As of February, 2010 we have over 650 members from all over the world.